Well, Kyle & I got back to my older brother's backyard for a bit of a dig (7 1/2 hours worth) on the 21st there. It felt so incredibly good to be getting out again, and I had been looking forward to the dig all week. My girlfriend decided to tag along this time for part of the day, though she drifted off to sleep a few times - apparently either not interested by what was going on to a great degree, or really just very tired, more than likely the former. This is probably because she wasn't there for the good stuff. We arrived at his house around 9:00, and after unloading our stuff, set to work (or play!). I had a really good feeling about the area we had dug last time. We had left off having unearthed a seriously large (6 by 10 foot) square yellow brick wall, only about two bricks deep, and set about 4" under the ground. We were confused as to what the short, crudely made wall was, but we were going to dig to find out. I had made it my ambition to dig the corner closest to the house, and had several promising dreams about it the nights before! Of course, I was soon to find out the thing about dreams is they often-times turn out to be just plain not real. I dug that sucker down about 5'. It was obvious I was in some kind of privy, as the white excrement material continued to come out, even at that depth. But I bottomed out at virgin clay about 5' down. Nothing there. That was disappointing. 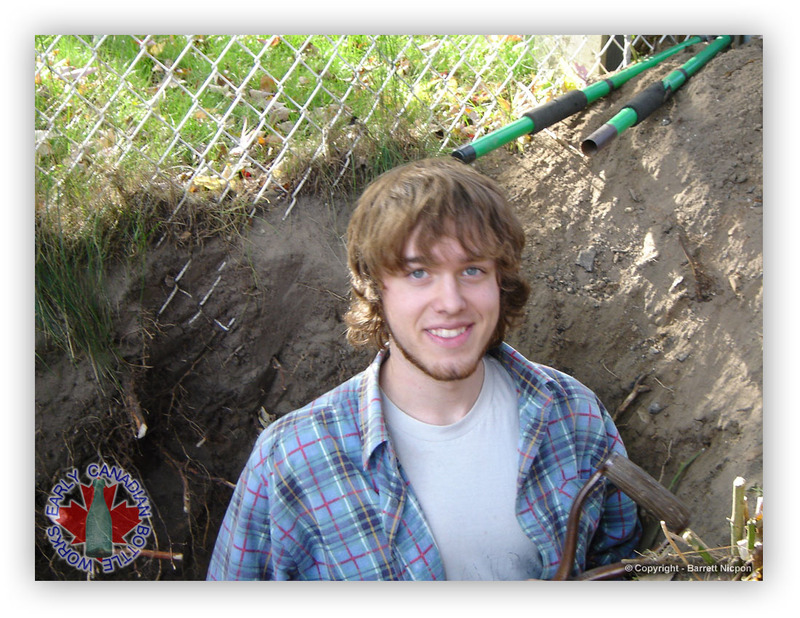 Kyle, however, was working on the other side of an old tree stump, and had been slowly working his way down through the roots. There were a LOT of roots. The tree stump was not entirely dead, you see, and had branches shooting off of it. The roots were thick and difficult to work with. The limited space of a narrow hole made using the cutters we had brought impossible. Kyle managed, though, and as I was filling my hole in, he was starting to find interesting stuff. About 2 feet down, he continued to pull out chunks of porcelain plates, and small bottle chunks. I told Kyle he was a trooper for not giving up on the hole, with all those roots. Upon probing into the bottom of the hole, he said, he could feel something deeper down. He had a good feeling about that hole. So he kept to it. Chunks of plate and teacup kept coming out about 3 feet down, and the ground softened up. Kyle raised a brow. I jumped into the hole for a quick turn, and could feel something with the shovel. Digging it out, it turned out to be a milk glass lamp base. Broken into two pieces, but all there. About an hour later, after we had come back from lunch, and my girlfriend had left for home, we returned to the site. It was my turn to dig, so I jumped into the hole, and narrowly missed landing on what looking like a lightning rod ball. it had fallen out of the tree roots while we were gone for lunch! I picked it up. Kyle grabbed it and proclaimed that it was the globe from the lamp. Sure enough, it fit perfectly on the base. Finding nothing much, my turn was up, and Kyle jumped in. 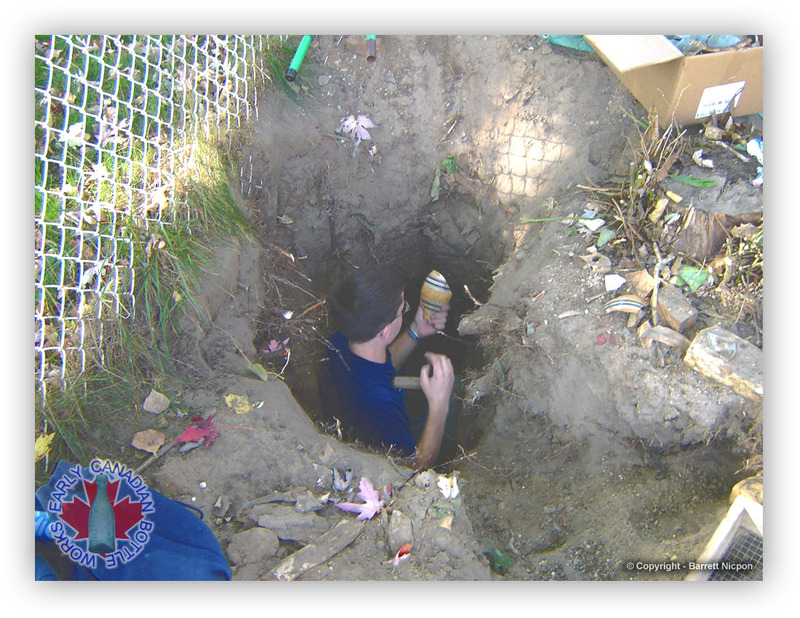 He was in the hole for scarce 5 minutes, and I was crawling around trying to sort through the debris which had come out, including a tea cup which Kyle noticed had a date of 1869 on the base. From the hole came a muffled cry, "Oh my God, Dude, a whole bottle!". He got my attention. I swung around to look, and spotted him holding a tall, ring-necked medicinal! We were ecstatic! Kyle soiled himself again, and we were both extremely happy to have seen the first intact bottle of the day! After 4.5 hours! Only minutes after, a three piece mould medicinal popped out, and then, what I thought was a wax-seal preserve jar, but with the very base missing. I demanded that it was my turn again! Kyle reluctantly gave in, and I hopped in. Probing with the shovel again, I hit something that looking intact. 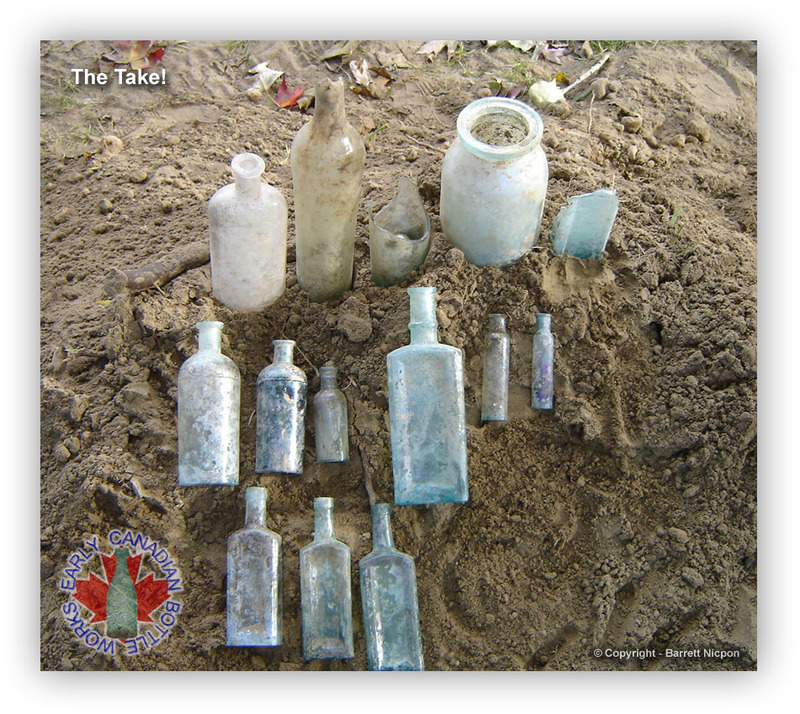 After gently freeing the item, a century-old cream pitcher came out of the ground. The handled was missing, and a hole had been broken out of the bottom, but other than that, the entire thing was there. So, after digging an additional few seconds towards the back of the lot, a small, pontiled (!) medicinal came out, along with another three piece mould, and a small, unembossed medicinal. All the while, a pitch fork was required, as the shovel was impossible to put in the ground, there were too many broken (and intact!) 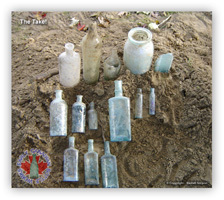 bottles and pottery pieces! While I dug, and unearthed a broken medicinal embossed on the base "St. L", Kyle was looking at the preserve jar we found earlier, and noticed that it had embossing. He read it off slowly, as it was somewhat weak, and the glass was very sick. 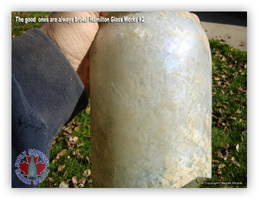 "Hamilton Glass Works", he said. "Aren't those worth a bunch?" I said. "Yeah." came the reply. We weren't happy that it was broken. So, having unearthed so much porcelain and glass that my head was spinning, I backed out and Kyle claimed his territory (having discovered the hole). Almost right away, he pulled out a small, unembossed medicinal, and hit something massive with the shovel. "Oh my God, Dude, it's huge!" He said. It turned out to be a gigantic porcelain washstand pitcher with the very base and handle broken off. He pulled out a broken "JAMES MILLS, ST. CATHERINES, ONT." bottle, which made us weep, and then he was up. Kyle was out, and I was in. After a few seconds, I decided to use the pitch fork, as too many large plate chunks were coming out. One probe, and 3 bottles fell out of the wall, one broken, one of them being another unembossed medicinal, and the last being another of those small bottles of what the hell. While this was going on, Kyle had realized that, from the shards, he could assemble part of a second (!) 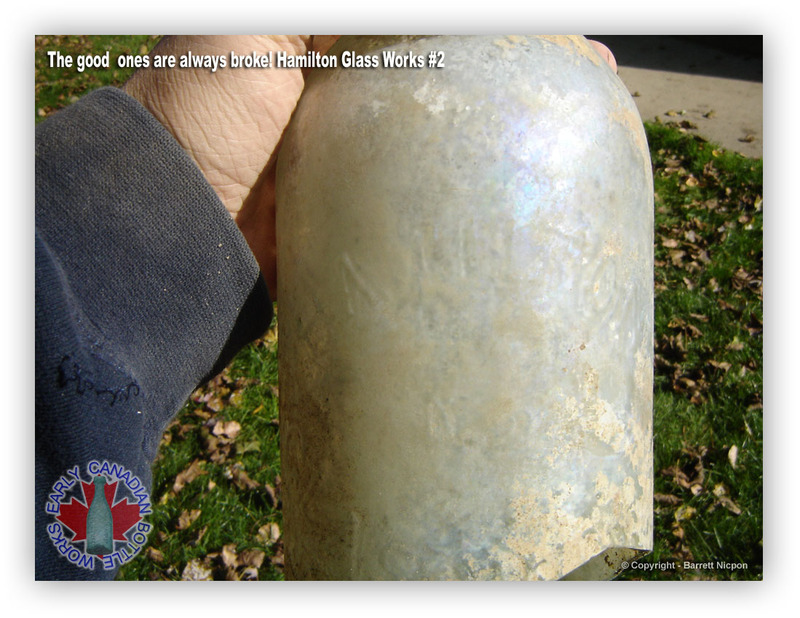 HAMILTON GLASS WORKS No.2 atmospheric preserve jar. Why were they both broken!?!? After I dug several broken wine bottles, Kyle was in, but only found several more broken wine bottles and pottery chunks. I took one more shot at it, and found the smallest sized three piece mould yet, this one with the cork still inside. And, that was it. An excellent day for us, as we're still ecstatic about finally finding older stuff! At this point, I'm still sorting through all the stuff we dug out. We filled a large cardboard box with shards and larger pieces. We were able to reassemble some of the stuff, such as a pontiled wine glass, and I have about 98% of a bennington ware chamber pot. It's being reassembled. Kyle & I also ascertained, once home, that we had actually dug a third (!) Hamilton preserve jar, but only very small pieces were present, only enough to see the embossing. This makes us think there must be another trash pit or something around. Oh, and, BTW, in case you're wondering about the terrible condition we left the yard in... it was like that when we started. My brother doesn't like his lawn much, I guess. Best of luck, all! We're still going back to mangle his lawn even more!